One of the items on my ongoing list of recipes to make has been a baked cheesecake. 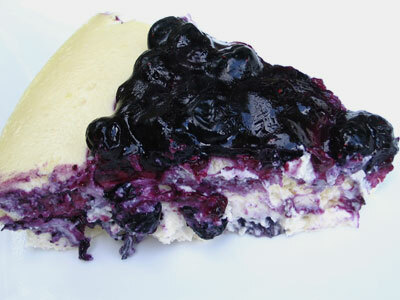 Until recently I had never made a cheesecake of any sort, although cheesecake is certainly one of my favorite desserts. I have very fond memories of the no-bake cherry cheesecake my Mom used to make for me. 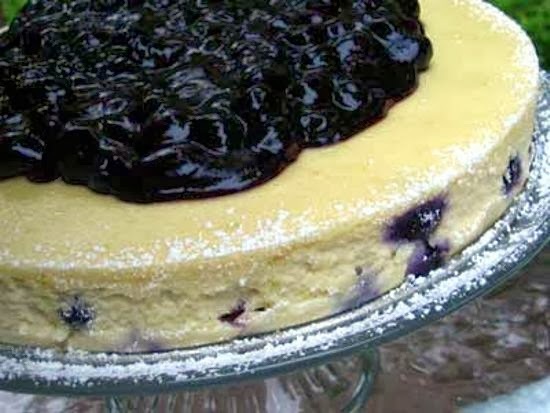 I don't very often have dessert, as most of the meals I make I find quite satisfying in themselves, but when I found this recipe for blueberry ricotta cheesecake in my bulging binder of food ideas I simply could not resist. It's a fancy looking cake but actually pretty easy to make — and needless to say, it's rich, creamy and absolutely heavenly to taste. Preheat an oven to 300° and butter a 9-inch springform pan. In a large bowl, cream together the cream cheese and sugar with an electric mixer set to medium until smooth. Add the ricotta, lemon zest and juice, vanilla and salt. Blend until well mixed. Add two of the eggs, beat for a minute, and then add the remaining two eggs and beat for another minute. Add the flour and beat on low speed until well mixed. Fold in the blueberries and transfer to the prepared pan. Bake for 80 minutes or until the the cake is set and golden. Turn off the oven, open the door slightly, and let the cake sit for another 20 minutes. Transfer the cake to a wire rack and let it cool completely before removing the sides of the spring form pan. Combine the blueberries, sugar, lemon juice and corn starch in a medium saucepan. Gently bring the mixture to a boil over medium heat. Stir for 5 minutes or until slightly thickened. Remove from heat and let cool for 15 minutes. 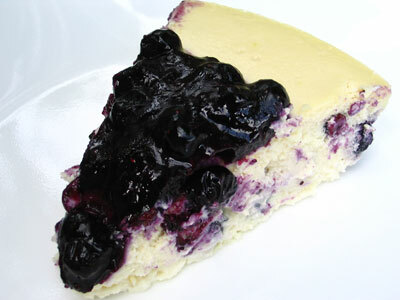 Spoon the blueberry sauce over the top of the cheesecake. Cut into wedges and serve. Refrigerate unused portions and eat within 2 days.